The 2014 NASA astrophysics division senior review panel has ranked NuSTAR second among the nine operating missions that were considered for extended operations. NASA has responded to the independent panels recommendations by approving continued operations through 2016 including the implementation of a Guest Observer Program that will begin in 2015. Details about the program will be available this summer. In the constellation Virgo, 2.5 billion light years away from Earth, a galaxy with little-understood properties generates massive amounts of energy and light. One of the biggest mysteries in astronomy, how stars blow up in supernova explosions, is being unraveled with the help of NASA's Nuclear Spectroscopic Telescope Array. New images from NASA's NuSTAR highlight a spinning, dead star and black holes blanketed in dust. NASA's black-hole-hunter spacecraft, the Nuclear Spectroscopic Telescope Array, or NuSTAR, has "bagged" its first 10 supermassive black holes. NASA's Nuclear Spectroscopic Telescope Array, or NuSTAR, is giving the wider astronomical community a first look at its unique X-ray images of the cosmos. Like "things that go bump in the night," a few high-energy events in the universe have captured the attention of the NuSTAR telescope. NASA's NuSTAR space telescope has found evidence of a slumbering massive black hole in a galaxy bursting with new stars. 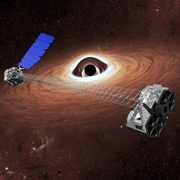 NASA will host a news teleconference at 10 a.m. PST, Wednesday, Feb. 27, to announce black hole observations from its newest X-ray telescope, the Nuclear Spectroscopic Telescope Array, and the European Space Agency's XMM-Newton X-ray telescope. NuSTAR has been in orbit around Earth for more than eight months since its launch in June 2012, studying black holes and probing the nature of the high-energy X-ray universe. The story of that delay, why it happened and what both NASA and Orbital Sciences learned from the experience. Since the science operations began on August 1st, the NuSTAR team has wrestled with learning to point the telescope's flexible system of optics, mast, spacecraft bus and solar array. NASA's newest set of X-ray eyes in the sky, the Nuclear Spectroscopic Telescope Array, has caught its first look at the giant black hole parked at the center of our galaxy. Ever since Princeton physicist John Wheeler coined the term nearly 50 years ago, black holes have evoked a sense of mystery and wonder for astronomers and space enthusiasts. But unlike comets, stars and other beautiful objects in the night sky, black holes can't actually be seen – they trap light, after all. Sept. 21, 2012, will mark 100 days since NASA's Nuclear Spectroscopic Telescope Array, or NuSTAR, launched into space from the L-1011 "Stargazer" aircraft.